As I write this (on Monday night), I’m sitting on the couch watching Parenthood on DVR and nibbling away at some awesome chocolate bark. Even though we have two Target bags FILLED with candy (we thought we’d have Trick or Treaters last week….it was cold and rainy…no one came to the door…we have tons of candy…someone take it please…) I bypassed all the mini Snickers, Baby Ruths, and Skittles and went right for the bark. That’s saying a lot. With the holidays just weeks away (gasp…true story), this is the ideal thing to whip up when you want to make something festive but don’t have the time/energy/ingredients/desire to bake. Here’s how simple it is: Melt a bag of chocolate chips in a glass bowl in the microwave. 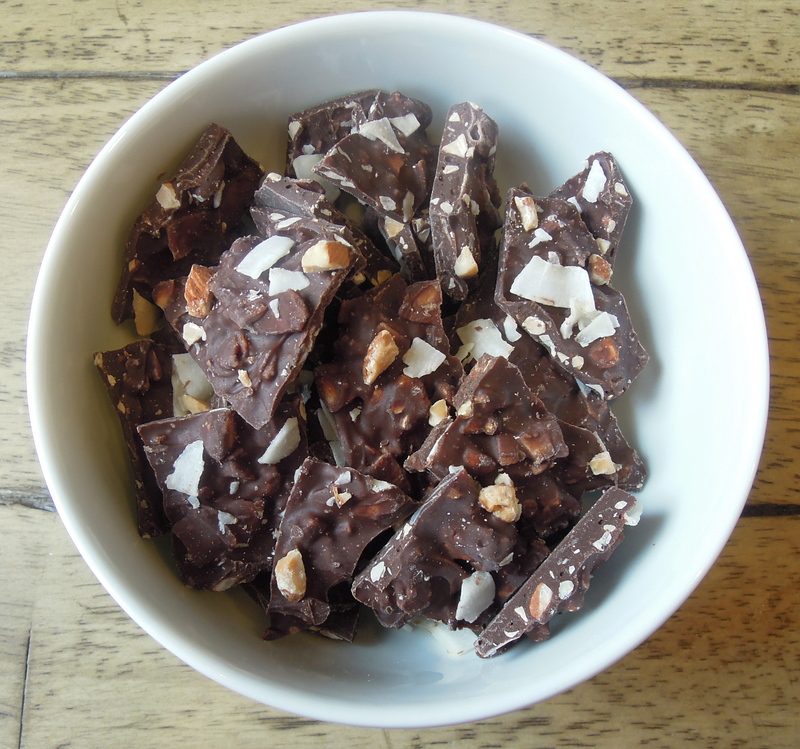 Add chopped almonds and coconut (or whatever add-ins you like…leftover chopped up chocolate Halloween candy would work well, too) and mix. Smear it onto a parchment-lined baking sheet. Stick it in the fridge or freezer for 30-60 minutes. Break up the bark into smaller pieces. Pat yourself on the back because this looks like it takes way more time than it does and if you put it out at a party it’s always the first very thing to go. Trust me, I have first-hand experience. Dump chocolate chips into a glass bowl. Microwave in 1-2 minute intervals, stirring after each one, until chocolate is melted. (It takes about 4-6 minutes.) 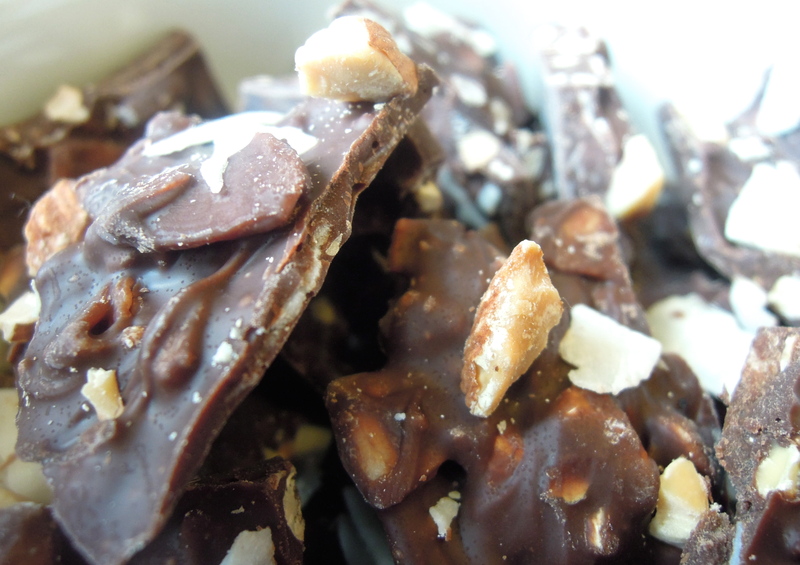 Add most of the almonds and coconut flakes to the melted chocolate, but reserve some of each for the topping. Pour melted chocolate mixture onto a parchment-lined baking sheet. Smear with a spatula as thick or as thin as you like it. Sprinkle remaining almonds and coconut flakes on top. Place baking sheet in the fridge or freezer for at least 30-60 minutes (longer is fine). Remove and break it up into pieces using your hands. Store in an air-tight container or bag at room temperature or in the freezer. This entry was posted in Dessert on November 5, 2013 by Paige Greenfield.